United Nations Children's Fund (UNICEF), along with the National Working Committee on Children and Women (NWCCW) and the National Bureau of Statistics (NBS), has published the 2014 "Children in Asia: An Atlas of Social Indicators", providing perspectives of the various situations of children in China. With the help of many visual aids, this fourteen-section publication reports relevant socio-economic information, reflecting China's achievements and disparities for children and serves as a "comprehensive and detailed resource for relevant government departments, child rights practitioners and the general public." 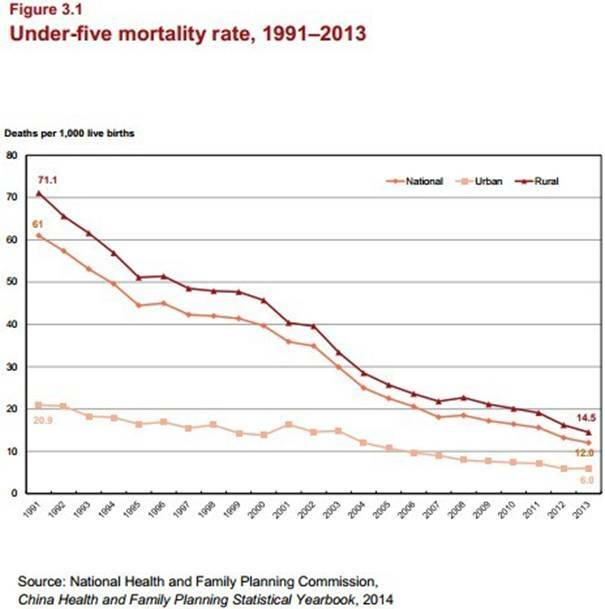 In 2013, the estimated number of live births in China varied between 15.1 and 18.5 million children, and the Government in recent years initiated a series of reforms dedicated to: piloting public hospital reform, improving grassroots healthcare services, establishing a national essential medicine system, reducing disparities in basic public health services and supporting the establishment of a comprehensive basic medical security/insurance system. While China may be doing well on many child indicators in aggregate national terms, this masks major inequalities and disparities across regions. For example, China has achieved the MDG-4 targets on infant and under-five mortality and is on track to achieving the MDG-5 target on maternal mortality, but the absolute number of maternal and child deaths remains high and significant rural-urban gaps remain also. Overall, coverage of MCH services is high, with more than 3,000 institutes across China. Service coverage rates may explain some urban-rural differences, with antenatal care and hospital delivery rates slightly lower in rural than in urban areas. And several provinces and cities have developed local policies to integrate migrant children into the local immunization system and to increase systematic health care for migrant women. The national target is to reduce the share of out-of-pocket expenditure to below 30% by 2015, but global evidence indicates a more substantial reduction is desired, as a 15-20% threshold can incur catastrophic expenditures. Mortality is heavily concentrated in the first year of life, especially during the four weeks after delivery. The main causes of child mortality are intrapartum-related complications, preterm birth complications, pneumonia, injuries, congenital abnormalities and diarrhoea. 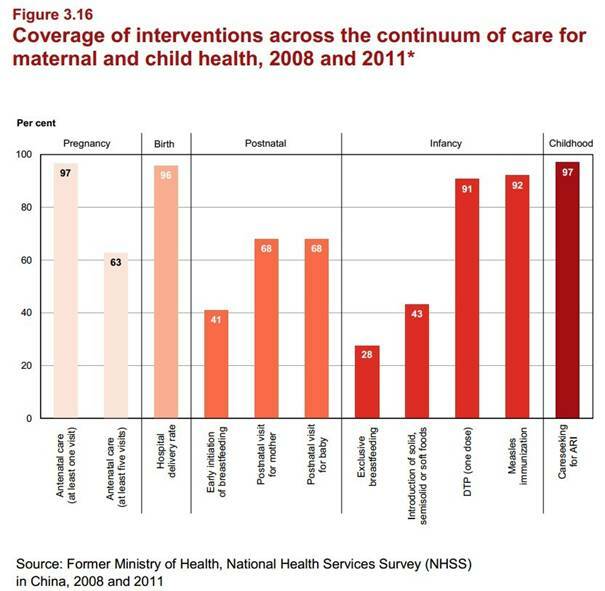 The Law on Maternal and Infant Health Care (1994) and the National Plans of Action for Women and Children (1990s, 2001–2010, 2011–2020) are usually mentioned as core components. Additionally, both the Rural Cooperative Medical Scheme (RCMS) and Medical Financial Assistance Scheme (MFAS) provide further relief to rural areas. However, insufficient attention is still given to insuring the youngest children. Children below 1 year of age are three times less likely to be insured compared to their 1 to 3 year old peers and almost six times less likely than children 3 to 5 years of age.